I have never made lasagna in the crock pot before, but now that I have I will be hard pressed to make it any other way. Of course, it doesn't hurt that there is feta cheese in here, which I have a love affair with. I used the no-boil noodles with this recipe and it came out perfect. Now I just have to share this recipe because you need to have it! You really, really do. It's that good. And, you're welcome! Lightly coat the inside of the crock pot with cooking spray. Spread 1 cup tomato sauce in the bottom of pot. Arrange a layer of the lasagna noodles over the sauce. In a large bowl, combine ricotta cheese,feta cheese, salt, pepper, garlic powder, oregano, parsley and eggs; mix to thoroughly combine. Add spinach (I trimmed the stems and rolled the leaves in a bundle and then sliced... but that's just me.) Stir again to incorporate the spinach in the mix. Spread 1/3 of the mixture over the pasta. Sprinkle a layer of mozzarella and 1/3 of the Parmesan cheese over the ricotta mixture. Top with a cup of tomato sauce. Repeat these layers until all ingredients have been used up. 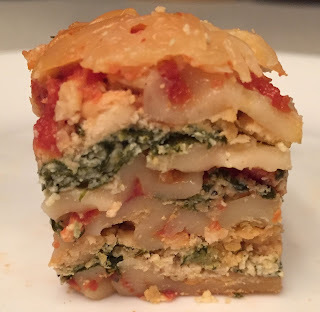 Top with a final layer of lasagna noodles, cover with tomato sauce and sprinkle remaining mozzarella and Parmesan cheese. Cover and cook on HIGH for 3 1/2 to 4 hours. Turn off and let stand, uncovered for 35-40 minutes to let the liquid be absorbed. Prepare to be in love! Several years ago (the 1980's to be exact) at a brunch of creative friends, someone made this soup. I was smitten from that day on! Through the years when time was a commodity I was lacking in, I' "tweaked"it just a tad. The original recipe called for baking the potatoes one day, and chilling in the 'frige overnight, then making the soup the next day. Who has time for that anymore? Enter hash browns (the cubed kind) from the frozen foods section at the grocery store. What a game-changer. Melt butter in large pot, stir in flour. Heat and stir until smooth. Gradually whisk in milk. Stir constantly until thickened. Reduce heat, simmer for 10 minutes. Add remaining ingredients and stir until cheese is melted. Cut up the carrots and potatoes however you like 'em. (big chunks, diced...whatever) and place in the Crockpot. Put roast on top of veggies. Sprinkle all 3 packets of mixes on top. Pour the water on top of all and cook on low for 6-10 hours, until tender and veggies are cooked through. Love Shrimp? This is a super easy one. Shell and devein the shrimp. Melt butter in skillet, add lemon juice and seasonings. Saute shrimp in hot herb butter over medium heat, about 8 minutes, or until pink. Serve hot and over rice. I didn't use the Cayenne pepper in this dish last night, and I think I prefer it without now. If you don't have fresh shrimp, it's perfectly ok to use the (thawed) frozen, pre-cooked kind. Just adjust your times to accommodate..you want to eat shrimp, not rubber. and if you do try this dish, come back and tell me how you liked it! I must really like you to be showing you this! Now that it's all out on the counter, I start weeding through things I haven't used, but thought it necessary to buy at one point. Snapped pics of 'em with my iphone and texted some other ladies to ask if they had a use for these things. Got their quick responses and went straight to my car (and put them in batches) in my trunk to deliver. Out of sight, out of mind, ya know. Cleaned out the cabinets, wiped 'em down really well and back in they go! 1 envelope dry onion gravy mix, or dry onion soup mix. Sprinkle salt evenly on both sides of cube steaks. Combine flour, pepper and garlic powder in a gallon size zipper type bag. Shake the steaks in the bag to coat with flour. Brown steaks (two at a time) in hot oil - abt. 3-4 minutes on each side. When all steaks are browned, drain drippings reserving 1 TBSP oil in pan. Saute' onion and bell pepper in drippings for about 7 minutes, or until tender. Return steaks to the skillet and cook for 55-60 minutes, or until tender. I would love to hear back from you if you try this! The cola makes it really tender. About 5...(or was it 8??? ) years ago I bought a cook book from QVC all because of these. Red Velvet Bon-Bons. You won't believe how incredibly easy they are! The only "hard" part is dipping all these balls into chocolate, and that's because I hate the tediousness of it. I made them one year for the Christmas Eve get-together my family has. All the family, cousins, aunts, uncles, in-laws, and immediate family gather on Christmas Eve for food and games. Ever since, these are "expected" to be there. (Last year I made something different. Boy! You would've thought I had told them there was no Santa this year. So, if you've never had, or heard, of Red Velvet BonBons, I'm going to share with you now. Roll into balls. Don't get OC about this, just make the balls however big you want 'em. 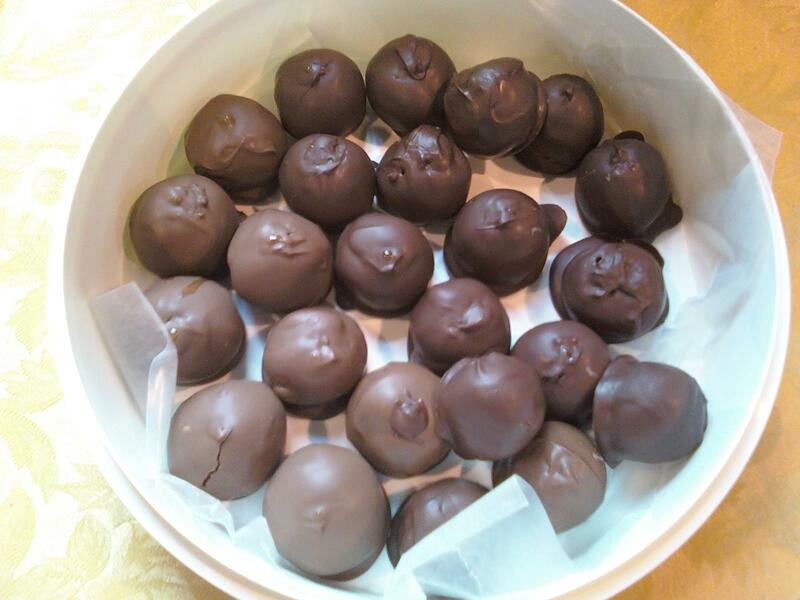 Put the balls onto a wax paper lined cookie sheet and put in freezer for an hour...or two. When the chocolate is melted, pop 'em out of the freezer. Dip in the chocolate onto another wax paper lined cookie sheet. (I used a toothpick to spear the balls and dip into the chocolate. That's it! Now go and impress! NOTE: You can probably notice in the pic that I used milk chocolate on half of 'em, and dark chocolate on the other half.